An afternoon spent wandering the streets of an 18th century French fortified seaport - the Fortress of Louisbourg National Historic Site in Nova Scotia. Of Louisbourg National Historic Site in Nova Scotia. We finally arrived on Cape Breton in Nova Scotia. The ferry arrived in North Sydney on schedule at 3:00pm after travelling nearly 15 hours from Argentia on the Avalon Peninsula of Newfoundland. We decided to head straight to the town of Louisbourg after getting a few supplies in Sydney. We pulled into the campsite early since they had internet service so that we could do a little work then settle in leaving tomorrow free to explor the area! Louisbourg is famous for the Fortress of Louisbourg which is Canada's largest historical reconstruction - it is also a National Historic Site. Since our campsite was situated a stones throw away from the entrance we decided to walk to the site - it was a beautiful sunny day afterall. Once we arrived at the visitor centre, we got a good sense of just how popular the place was - there was a nice long queue just to get tickets! The Visitor Centre is situated quite a distance from the actual site of the Fortress, so with tickets finally in hand we headed to the bus stop for the 3 minute bus ride to the fortress entrance. The Fortress of Louisbourg was founded by the French in 1713 to protect France's interests in the new world and was a busy fortified seaport until its abandonment by the British in 1768. It was also a place of significance in the Franco-British struggle for empire. Nowadays the grounds are bustling with costumed animators and tourists. Demonstrations of dance, music, lace making, and forging etc were in progress just about everywhere you looked. We were even part of the crowd during a public punishment of a fisherman who stole a bottle of wine and later spent time wearing the iron collar. Costumed men and women added to the authenticity of the event and were leaning out of their windows shouting out "hang him" or "you should be ashamed of yourself"! It was quite entertaining! We also watched the preparations of the cannon firing which began with a military procession from the main gates to the row of cannons guarding the fortress outer walls. After cleaning and loading the cannon gun, a drum roll preceded the loud "boom" which ended the 20 minute demonstration. In all, we spent around 3-4 hours at the fortress having lunch at one of the restaurants decked out like it might have been in the 18th century. We could have spent more time but it was nearly closing time so we made our way back to the bus for the journey back to the visitor centre then began our walk back to the campground. 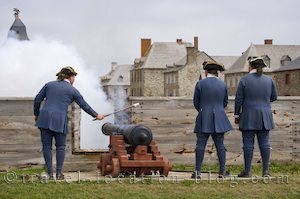 The Fortress of Louisbourg is a definite must see and gets our thumbs up! It is very well laid out with authentic buildings and demonstrations by costumed interpreters who really play their parts well!